You are a royal, seeking new lands to expand your ever-growing kingdom. Explore and conquer the different terrains, and develop the best and richest territories for your people. Scour lands full of wheat fields, forests, grasslands, lakes, swamps, mines, and towns, diversifying your kingdom's riches along the way. Tax the lands wisely to fund the construction of your towns, pick the buildings you erect carefully, and try to win the Queen's favor; all while making sure your plans aren't foiled by the Dragon's flame. Make sure to strategize and acquire carefully, as others are also competing for the same lands, a stake in the riches, and the heart of the Queen! Be the player whose 5x5 kingdom (3 to 4 players) or 7x7 kingdom (2 players) earns them the highest number of points. Players earn points by strategically selecting dominoes for their kingdoms, and then matching and connecting them to form different territories. Each domino has 2 terrain squares, and a territory is a group of matching terrain squares that are connected horizontally or vertically. Territories only earn points if they include at least one crown. Players can also earn points by buying buildings for towns in their kingdoms, and placing them on open construction squares (red terrain). By placing buildings in their kingdoms, players reap bonuses immediately, during future turns, and/or at the end of the game. The more connecting terrain squares, point-earning crowns, and building bonuses a territory has, the more points players receive at the end of the game. A Position the box as shown. B Shuffle the dominoes and then place them in the box. Make sure the gap in the line-up of dominoes is facing away from players (meaning neither the number nor the terrain sides are visible to anyone). This will be the draw pile for the game. All dominoes will be used regardless of the number of players. C Place the Builders' Board in the center of the table, so it is accessible to all. D Shuffle the 32 Building Tiles and place them, grey face up, on the red square of the Builders' Board. This is the draw pile for Building Tiles. E Take the top 6 Building Tiles and place them, grey face up, on the empty spots of the Builders' Board. The number below each tile represents the construction cost for each building. F Place the Queen on the side of the board, and the Dragon on the cave next to the Building Tiles' draw pile. G Place the Towers, Coins, and Knights on the side of the Builders' Board. The piles of Coins form the bank. H Have each player take a single-square Starting Tile and a Castle. Have each player put the Starting Tile, with the Castle directly on it, Iin front of them. J Each player also draws one Knight, and Coins that add up to a value of 7, placing these in front of them. 1 To start, take the first 4 dominoes from the box and line them up numerically, terrain side down. They should be visible and accessible to all players. The lowest number should be at the top of the vertical line and the highest number at the bottom. Then, flip them over so the terrain side is exposed. 2 To determine the order in which players will select their first domino, one player takes all 4 Kings in their hand and pulls them out one at a time. The first King to be pulled indicates which player can select first etc... Players select their first domino in this order, placing their King on a free domino to claim it. (In a 2 player game, one King is drawn randomly. The player whose color it is places their King on the domino they wish to select. Then, it is the second player 's turn to place 2 Kings, and finally, the first player places their second King on the remaining domino). In this example, the white King is drawn first, and its player selects the fourth domino in the line. The orange King is drawn second, and its player selects the first domino. Then the purple King, drawn third, is placed on the third domino. As only the second domino remains, the player with the red King (drawn last) is forced to select that domino. 3 When all 4 dominoes are claimed, select 4 new dominoes from the draw pile. Again, line them up numerically, terrain side down, next to those already selected. Then, flip them over (Note: in a 3 player game, discard the last unselected domino every round). Please note that only A and Eare mandatory actions, with the rest being optional. After the first player has taken these actions, the player whose King is on the second domino then takes their turn. This continues until the player whose King is on the last domino has played. Then, a new round starts (see Starting a New Round ). 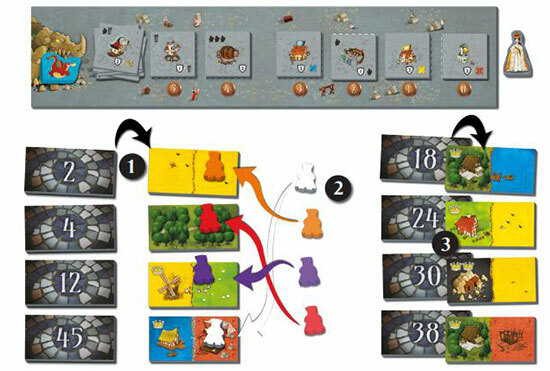 In a 2 player game, each player will take actions A to Etwice; once for each of their Kings. A kingdom may not be more than 5x5 squares (3 to 4 players) or 7x7 squares (2 players) in dimension. When connecting a domino to another domino, horizontally or vertically, at least 2 connecting squares must have the same terrain type (one on each domino). The 4 sides of the Starting Tile are wild; any terrain can be connected to them. Once a domino is in place, it may not be moved. Important:. 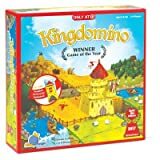 If a player selects a domino (or is forced to select a domino) that does not fit into their kingdom because it violates the 5x5 or 7x7 dimension rule, or it does not match any available terrain type, it must be discarded from the game. Points are not earned for discarded dominoes. Dominoes cannot be discarded if they can be placed in a kingdom using the above rules. Anticipation skills are crucial if you want your kingdom to be complete at the end of the game. If you have Knights available (the one given at the start of the game, plus any earned through Building Bonuses ), you may choose to collect tax right after connecting a domino to your kingdom. Take a Knight and place it on the domino you just added. Immediately collect a Coin value equal to the number of connecting squares in the territory your Knight was placed on. The Knight will stay on this square until the end of the game. You may place up to 2 Knights during your turn, one for each square on the domino you just added to your kingdom. You may place a Knight on a territory where other Knights have been placed in previous rounds. You need to have at least one red construction square available in order to construct a building in your town. This square does not have to be on a domino that was just added (it could have been added in a previous round). Choose a Building Tile that is available on the Builders' Board (you cannot take one from the draw pile). Pay the bank the construction price listed for the chosen building. Add this building to your kingdom on the construction square of your choice, red side up. Collect the immediate Building Bonuses (if any), and make sure to remember any active Building Bonuses for future rounds. When a building is constructed, it leaves an empty spot on the Builders' Board for the duration of the round. You may only place one Building Tile per construction square (you cannot stack up buildings). Take the number of Knights indicated on the tile, you may use them to collect tax as soon as your next turn. Place the number of Towers indicated on the tile in your kingdom. As soon as your kingdom has acquired the most Towers (even in the case of a tie with another player), it hosts the Queen. 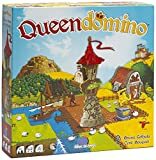 Take the Queen Meeple from her current location and place her in front of you. The Queen : When your kingdom hosts the Queen, she lowers your construction costs by 1 Coin. 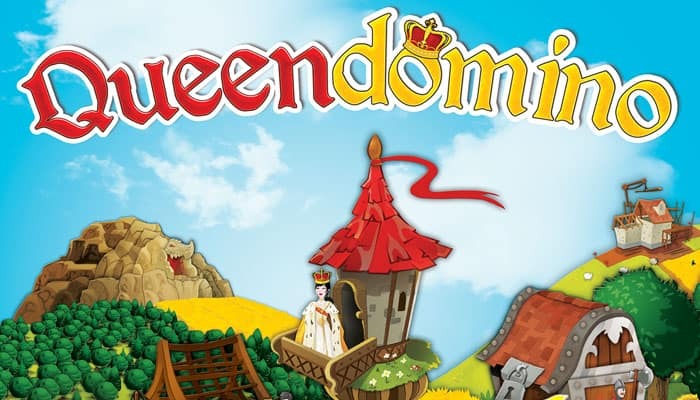 If you are the one to host her in your kingdom at the end of the game, you will place her on your largest territory (the territory with the most connecting terrain squares) and she will count as an extra crown. In the lower left corner of some of the Building Tiles, an additional bonus is symbolized; it applies to each turn, for the rest of the game, after the building is constructed. This information is visible on both sides of the tile. Each time you collect tax, you immediately collect an ADDITIONAL Coin value that is equal to the number of Knights in your possession (both those in your kingdom and those you have not placed). Each time you collect tax, you immediately collect an ADDITIONAL Coin value that is equal to the number of Towers you have in your kingdom. A crown is pictured in the upper right corner of some of the Building Tiles, on both sides. At the end of the game, each of your town territories (whether you built on them or not) will be worth as much as the number of connecting squares times the number of crowns in this territory. On some of the Building Tiles, a symbol appears on both sides, in the lower right corner, showing the number of points that this building gives your kingdom at the end of the game. Your kingdom earns the indicated number of points. Detached territory bonus: You score 2 points for each individual territory in your kingdom, regardless of the number of squares and crowns in those territories. The color of the cross indicates which terrain type the bonus applies to. Tower bonus: You score 1 point for each Tower in your kingdom at the end of the game. Knight bonus: You score 1 point for each Knight in your kingdom at the end of the game (this applies to both used and unused Knights). You can ONLY take this action if the Dragon is still hiding in its cave AND you are not hosting the Queen. Choose any Building Tile that is still available on the Builders' Board. Pay the bank 1 Coin. Burn down the building by removing it from the board, and replacing it with the Dragon. Discard the tile into the box for the remainder of the game. Only one player per round can use the Dragon. 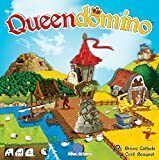 After adding a domino to their kingdom, and carrying out whichever actions they wish, players then select any available domino in the next line, placing their King on top of that domino to claim it. Note: While higher numbered dominoes are more valuable, with mixed terrains and point-earning crowns, claiming them results in having less of a choice for the next round... it 's all part of the strategy! Send the Dragon back to its cave. Slide the Building Tiles remaining on the Builders' Board over to the cheapest spots, and then fill the empty spots with Building Tiles from the draw pile. Form a new line of dominoes next to those already claimed by selecting 4 new dominoes from the draw pile. Again, line them up numerically, terrain side down, next to those already selected. Then, flip them over (Remember: in a 3 player game, discard the last unselected domino every round). A new round can then start. 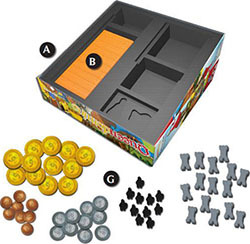 A game takes a total of 12 rounds, regardless of the number of players, and uses all the dominoes. When the last 4 dominoes are lined up, all players take their final turn (only carrying out actions A through D, as there are no more dominoes to be chosen). Each player should now have a 5x5 grid in front of them (for a 3 to 4 player game) or a 7x7 grid (for a 2 player game). Some kingdoms may not be complete if a player was forced to discard a domino (see action A). If you are the player hosting the Queen, place her on your largest territory (red towns included) where she will count as a crown. Wealth : 1 point for every 3 unused Coins. Territories with crowns: (wheat fields, forests, lakes, grasslands, swamps, mines, towns) A kingdom is composed of different territories; a territory is a group of matching terrain squares that are connected horizontally or vertically (not diagonally). For every territory, count the number of connecting terrain squares and multiply that number by the total number of crowns found in that territory. Territories without crowns do not score points. It is possible to have multiple territories with the same terrain type in your kingdom, they are scored separately. To avoid errors when calculating Building Bonuses for the red town territories, pull any Building Tiles you constructed off their squares one-by-one and add up the points from the lower right corner symbols as you go. After all the boxes have been recorded for all players on the Scoring Pad, add up the final scores in the last box. The player with the highest score wins the game. In the event of a tie, the player with the largest territory (the biggest group of matching terrain squares that connect) wins. If there is still a tie, the players share the victory.